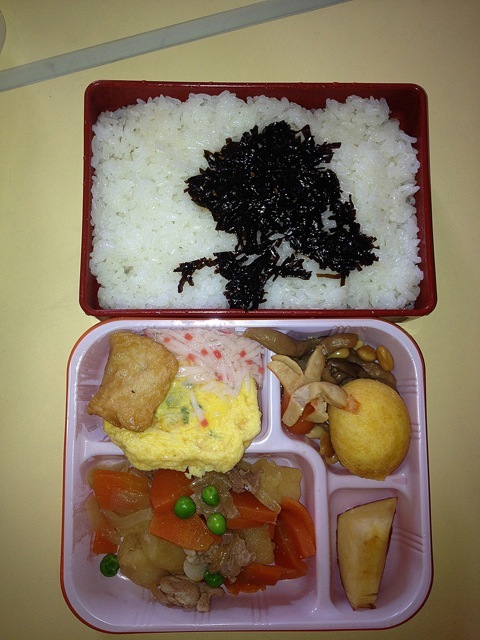 Contents: Rice w/konbu (a sweet seaweed), nikkujagga (beef with veggies), omelette, sausage, potato puff, and apple. Notes: School Lunch at a pre-school in Japan. The kids are aged 1-6yrs old. The pictures are of the "teachers" lunch; the kids are exactly the same just with a lot less rice and smaller portions.